Phi Kappa Theta Fraternity Trustee, Michael Van Poots (Rensselaer Polytechnic Institute, ‘95) has been elected to be the next Chief of Staff for Office of Naval Research (ONR) Reserve Component & the next Commanding Officer of the ONR Headquarters Reserve Unit in Washington D.C.
Van Poots has nearly 25 years of Navy experience including 7 board selected command tours, a tour as the ONR-RC Assistant Chief of Staff, Communication & Policy and has served in numerous ONR-RC project/mission leadership roles. He brings to his new position a strong passion for innovation and an un-ending level of positive energy. He has a BS in Engineering Physics, a Masters in Business Administration and a PhD in Applied Management and Decision Sciences. The CoS serves as an advisor to ONR-RC Leadership on the workforce, runs the ONR-RC staff, and is the steward of our workforce's innovation culture. Please join us in congratulating CAPT Van Poots in his new leadership role! Captain Michael R. Van Poots hails from Sparta, New Jersey and is a 1995 graduate of the Naval Reserve Officer Training Course earning a BS degree in Engineering Physics from Rensselaer Polytechnic Institute, Troy NY. Following nuclear power and basic submarine training, he reported to USS BALTIMORE (SSN 704) while preparing for deactivation at Norfolk Naval Shipyard. Prior to completion of final operations, Captain Van Poots made several missions from Norfolk VA, serving as Electrical Assistant. He qualified as Diving Officer and Engineering Officer of the Watch, earning the Joint Meritorious Unit Award.In October 1997 Captain Van Poots reported to USS MONTPELIER (SSN 765) in Norfolk VA serving as Reactor Controls Assistant, Chemical and Radiological Controls Assistant, Diving Officer,Quality Assurance Officer, and Damage Control Assistant. He qualified in Submarine Warfare and as a Prospective Nuclear Engineer Officer, earning the Battle “E” Award, Navy Expeditionary Medal, Navy Sea Service Medal, and Navy Arctic Service Medal.In August 2000, Captain Van Poots transferred to the Navy Reserve. He served three years in various department head roles with NR COMSUBRON SIX Detachment 504 in Reading, PA. In October 2003, he reported to NR COMSUBGRU TEN FORCE PROTECTION Detachment 2, serving as the Administrative and Training department head and Officer In Charge of force protection details in Port Canaveral FL. In October 2004 he assumed command of NR RECRUITSUPUNIT Detachment 428 in Amityville, New York. In December 2006 he assumed command of NR NSF NSA NAPLES Detachment C in Capodichino Italy, earning the Navy Meritorious Unit Commendation. In December 2008 he assumed command of NR NSF SUGAR GROVE in Sugar Grove, WV. In 2009 he was recalled to active duty as Inspector General JTF-GTMO in Guantanamo Bay Cuba earning the Joint Meritorious Unit Award (2). In December 2010, he served as Operations Department head NR USFF MOC GRBO in Greensboro NC. In December 2012, he assumed command of NR USW OPERATIONS Detachment N in Charlotte, NC. In December 2014, he assumed command of NR NRL S&T 104 in Washington DC. In December 2016, he assumed command of NR NRL S&T 105 in Norfolk,VA. 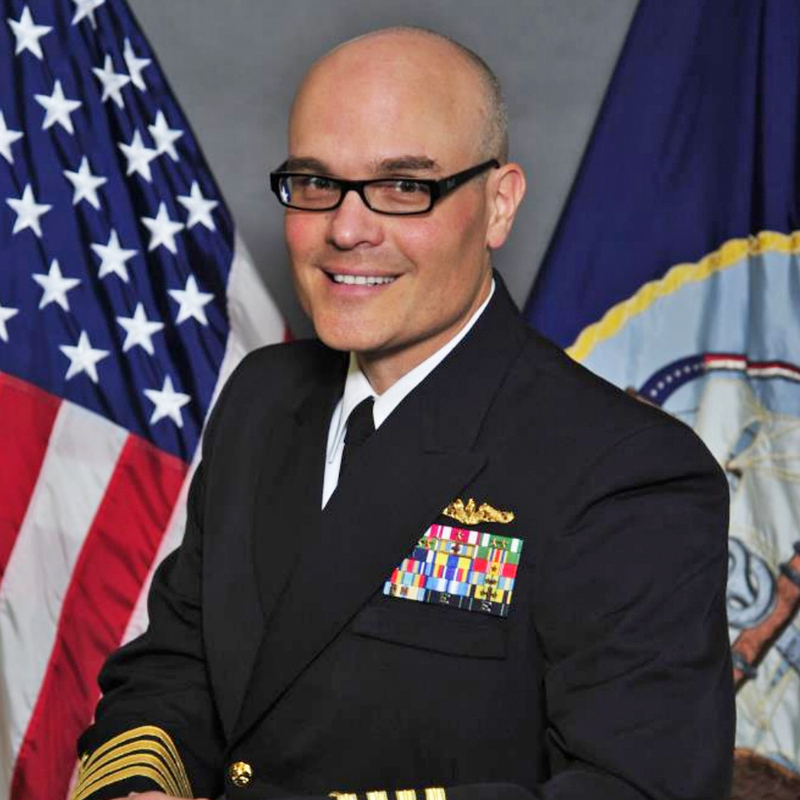 In December 2018, he assumed command of NR HQ NRL S&T 100 in Washington DC and is the Chief of Staff for the Office of Naval Research Reserve Component.His personal awards include Defense Meritorious Service Medal, Meritorious Service Medal (2), Navy Commendation Medal (3), Navy Achievement Medal (5), National Defense Medal (2),Global War on Terrorism Expeditionary Medal,Global War on Terrorism Service Medal, Military Outstanding Volunteer Service Medal (3), Armed Forces Reserve Medal, Navy Recruiting Service Award (4), Expert Rifle Marksmanship Medal, Expert Pistol Marksmanship Medal, Commander Submarine Group Two and Commander Navy Region North East Letters of Commendation. He received instruction at the U.S. Navy Anti terrorism Warfare Development Center, is a graduate of the Joint Professional Military Education program at the Naval War College, U.S.Army Inspector General School, and is designated a US Naval Academy Blue and Gold Officer.In his civilian career Captain Van Poots is the Technical Services Manager for Miller Coors at the Shenandoah VA Brewery. He earned a Masters of Business Administration degree from Rensselaer Polytechnic Institute, Troy NY. He earned a PhD in Applied Management and Decision Sciences from Walden University. Captain Van Poots is married to Holly Anne (Hurt) Van Poots of Roanoke, Virginia.They have two sons and reside in Harrisonburg, Virginia.